1992 – Chicago Tribune, May 3, 1992 "Invisible Workers of DuPage County, Behind the Scenes – But Ahead of the Game". 1992 – Chicago Tribune, Sunday July 19, 1992 "And They Do Windows, Trio Cleans up By Getting Personal". 1994 – Civil Engineering Magazine, February 1994 "Sealant Coats Building During Windy City Winter". 1995 – The American Window Cleaner Magazine, July 1995 "1995 Ettore Scholarship Awarded to John Carey Jr., son of Service One employee, John Carey…"
1995 – IREM Newsletter, Winter 1995 "Safety requirements for Window Cleaning: The Controversy Behind Bosun’s Chairs" by Tom Trinen. 1996 – Featured in 6 issues during 1996 of Where Chicago featuring Service One technicians on a suspended scaffold for print ads for Lettuce Entertain You Restaurants. 2000 – The Daily Herald, July 27, 2000,"Window washer safety no longer up in the air". 2000 – March airing of Chicago Hispanic station WTTW interview with Service One’s foreman, Frank Ramos, featuring an interview 500 feet in the air while Frank was suspended on the side of the Swissotel in Chicago. The story was eventually nominated for an Emmy award for editing. 2000 – July Miami based National Hispanic station WTTW again featured Service One foreman, Mr. Frank Ramos in a second interview at a Michigan Avenue location, the story was aired nationally. 2001 – The New Orleans City Business Journal, June 12, 2001 "Cleaning the Windows on High Rises is A High Risk Job". 2002 – "Beyond Tough" Aired September 25, 2002, on The Learning Channel. "Beyond Tough" is a one – hour reality television show that examines tough jobs and lifestyles. A power – packed roller coaster ride hosted by Ice – T, the segment feature Service One and employees J. Carey and W. Beeler. Beyond Tough Productions, by Crosstown Entertainment, Executive Producer: Andre Jetmir; Producer: Anneli Gericke. 2002 – Daily Herald (September 3, 2002) – Interview spotlights Service One employee Wes Beeler, who was also featured on The Learning Channel’s "Beyond Tough" segment profiling dangerous jobs hosted by celebrity "Ice – T". 2003 – Service One Inc. employee Walter Diaz received a Safety Award from Turner Construction for outstanding service and attention to safety for the Notre Dame, Maria DeBartolo Performing Arts Center. 2004 – Ettore Award for unselfish devotion and support to the International Window Cleaning Association awarded to Tom Trinen, President of Service One, Inc.
2007 – Window Cleaner of the Year Award – Ten year veteran employee Reyes Hurtado was awarded the International Window Cleaning Association’s "2006 Window Cleaner of the Year" award for outstanding performance and expert knowledge. 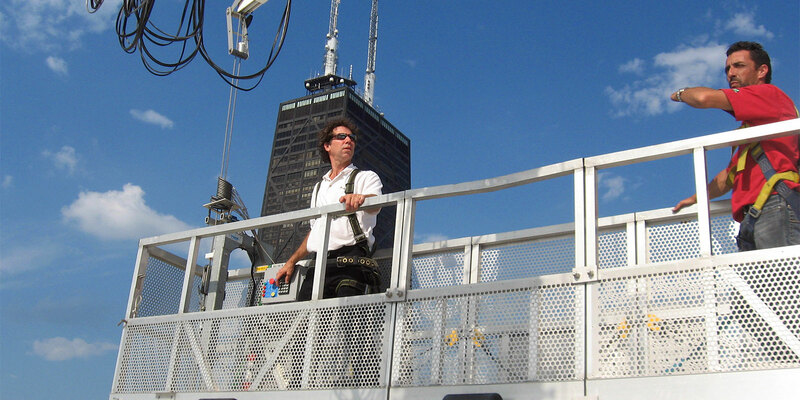 2008 – The Professional Window Cleaner (Fall 2008) article features Service One employee, Jose Ramirez, on the cover and an article written by Tom Trinen, "Rigging Challenges in the Windy City". 2009 – "Risky Living" Book features interviews with the brave men and women who work in the world’s most dangerous jobs, by author Tom Jones, features an interview with Walter Diaz, veteran high rise window cleaner with Service One. 2011 – Instant Upright Global Summit, Dublin Ireland, Tom Trinen presented "Project Summaries in Chicago utilizing Upright Scaffolding" featuring projects for Field Museum, Millennium Park and others. 2011 – "KFC extreme lunch delivery". Social media video promotion produced by Chicago based Advertising firm, Weber Shandwick. Service One employee Steve Frick, as a rope access technician, doubles for the real "Colonel Sanders", promoting "Extreme Lunch delivery" in response to their Facebook campaign where followers requested to see Colonel Sanders deliver a hot lunch to window cleaners 30 stories up. 2015 – JLG, "Cleaning Chicago Inside and Out"
2016 – Superheroes of Chicago – Featuring Service One rope access technicians dressed as Spiderman, Batman and Iron Man to warm the hearts of patients at Lurie’s Children’s hospital. Featured on Fox, NBC, ABC, Chicago Tribune and the Steve Harvey show.